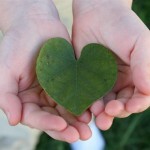 This is a joint giveaway with Living Peacefully with Children and Natural Parents Network. You may enter at Natural Parents Network only. Please find the section marked “Win it!” for the mandatory entry and optional bonus entries. I have to say that I was a bit skeptical about these oils when I first received them, despite the fact that I routinely use essential oils in our family’s health care. I’m a firm believer in using natural products for our health. There are so many products on the market which claim to eliminate and/or reduce stretch marks that the idea of one actually working seemed slim. I even bought a product after the birth of my first child and found that I had no desire to use it. I couldn’t tell any difference and didn’t continue with it. I had a tiny newborn who was taking most of my attention, and taking time to apply a product several times a day that didn’t appear to be working wasn’t something I wanted. As for the eczema oil, I decided to wait and see what happened. I decided to go into this as a two week experiment. We would try the products for two weeks and assess any changes. I was pleasantly surprised with the results. The first oil I tried was the Belly Oil. After having four children, it’s safe to say that I have some stretch marks. Since that short attempt with stretch mark cream after the birth of my oldest child, I have done absolutely nothing concerning these tiger stripes, accepting them as part of motherhood. The first time I used the belly oil, I was immediately impressed with the scent. This did not smell like the commercial product I had tried so many years ago. Hazelnut, sesame, jojoba, evening primrose,and rose hip seed oils are combined with rosewood, mandarin green, palmarosa, helichrysum, and neroli essential oils to make a lovely scent. As per recommendations, I applied the oil after my shower. The feel of the oil along with the aroma made me think of spa treatments. After a couple of days, I was looking forward to applying the oil and felt like I was pampering myself, something that many of us don’t do enough. That fact alone had me continuing to use the product. After several days, I noticed that my stretch marks were changing. While the color difference was still there, they seemed to be smoothing out, making them less apparent. After two weeks, I felt that my stretch marks were noticeably improved. Whether it was the special combination of oils or merely the moisturizing properties of the oil, I definitely felt pampered and wish that I had had this during my pregnancies. The second oil we used was the Newborn and Sensitive Skin Oil with Eczema Essential Oils Addition. While I didn’t have a newborn to try it on, my 9 year old had some eczema on his face. It was a small patch that never really seemed to bother him, so the idea of using a steroid cream didn’t seem worth the risk. I was curious how the oil would work. A natural treatment, along with continuing to cut out bothersome foods, seemed a safe and prudent way to deal with it. After only a few days of using the oil (and generally only once a day), we noticed that his eczema looked as if it was “drying up.” My other children wanted to see what it felt like, so I dabbed some on them. My 5 year old exclaimed, “This stuff smells awesome!” Sweet Almond, Olive, and Jojoba oils combined with Dill, Roman Chamomile, Lavender, and Mandarin Green Essential Oils not only smell awesome together, they are something I can feel comfortable putting on my children. Continued application seemed to be necessary, as the eczema seemed to come back a bit on days we forgot, which would be consistent with the fact that the oil is treating the symptoms rather than the cause. Overall, I would say I was definitely pleased with the products from Love Munchkin, a company born from a mother’s desire to avoid products with toxic chemicals for her. The owner, Linda, has studied nutrition and is a mother of two children. Her research into “the effects of artificial foods, preservatives, pesticides, GMO’s and all other things unnatural” led her to look further into the consequences of what we put into and on our bodies. Her desire to use simple, clean, and natural items for her family resulted in the products at Love Munchkin. Selling “skin nourishing oils made from the highest quality natural plant based ingredients,” the company’s products are chemical and preservative free, vegan, and contained in BPA-free containers. Love Munchkin is a member of the Safe Cosmetics business network. 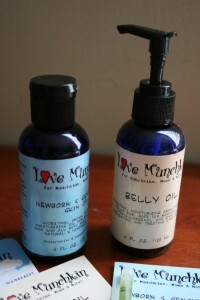 You can purchase your own Belly Oil or Newborn and Sensitive Skin Oil Plus Eczema Additions at Love Munchkin. The Belly Oil is $14.50 and various Newborn and Sensitive Skin Oils run from $12-$16. Right now, Love Munchkin is offering free shipping on all US orders! For your own chance to win a set of Belly Oil and Newborn and Sensitive Skin Oil from Love Munchkin, enter by leaving a comment and using our Rafflecopter system below. The winner will receive one bottle of Belly Oil and one bottle of Newborn and Sensitive Skin Oil. Contest is open to the US and CANADA ONLY. MANDATORY ENTRY: Visit Love Munchkin and tell us one thing you have learned about the company! You must enter your name and email address in the Rafflecopter entry system for your entry to count, after leaving a comment on this blog post. 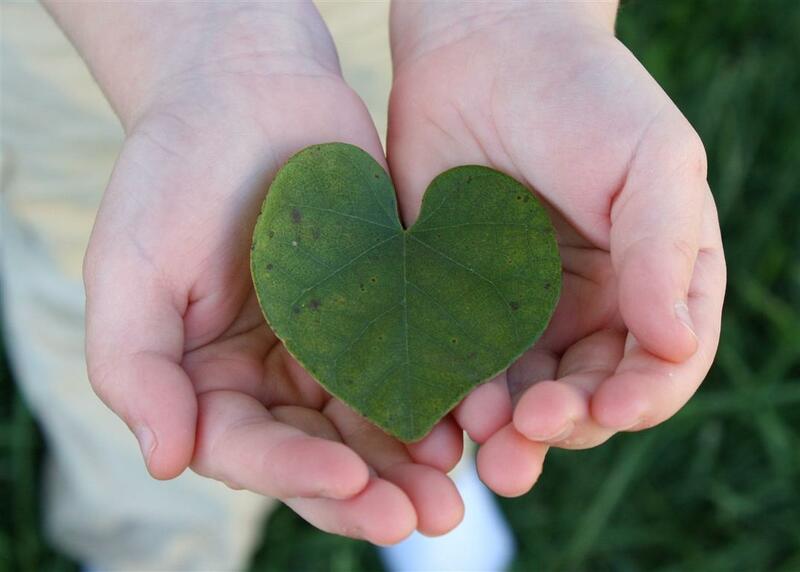 This is a joint giveaway with Living Peacefully with Children and Natural Parents Network. You may enter at Natural Parents Network only, and we’ll be recording IP addresses to ensure that there are no duplicate entries. That said, please do visit and enjoy both sites! Contest closes 18 August 2012 at 11:59 p.m. Eastern Time. 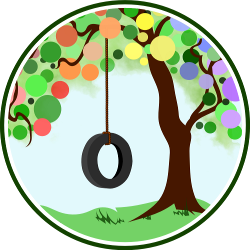 You can find Mandy at Living Peacefully with Children, where she writes about natural parenting topics such as unassisted birth, babywearing, breastfeeding (including child-led weaning), genital integrity, unschooling, bed-sharing, and gentle parenting/consensual living, along with some of her other musings about her journey towards simple living, her artistic leanings, and thoughts on some of the many books she reads. I love that the testimonials say how good it smells..I also used a somewhat stinky (albeit paraben free) lotion during pregnancy and I’d like something to really pamper myself with. I would love to try this, of corse! I took good are of my skin during pregnancy, but now I’m starting to lose weight and would love to nourish that skin more naturally, now that I know better that just paraben free isn’t good enough. Their containers are tested to be as ergonomic as possible, so whenever using either on yourself or your child, it’s as easy and mess-free as possible. I love that they have a $4 flat-fee shipping rate! I will enjoy using the oil, and so will my new baby, due Sep. 2! I like that the belly oil is paraben free! Love that all product labels are jargon-free! Me — the mama, due in two weeks — and our little girl! The product are vegan and paraben free, and they even have a flat shipping rate. I like that its all natural, also like the flat rate shipping. I love anything natural and this sounds amazing.